Grand, Greater, Common, Lesser, and Petty soul gems: all except Petty share the same model. Soul Gems are miscellaneous items which can be used to trap the soul of a dying creature or NPC. The resulting filled soul gems can be used as power sources for enchanted items, either when initially creating custom enchanted items or when recharging depleted enchanted weapons, either of which will consume the soul gem. 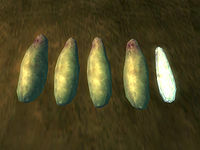 In addition to the soul gems listed here, the Shivering Isles expansion adds a Soul Tomato that can be used as the equivalent of a grand soul gem. They can be bought at most magical and alchemical shops. Regular Soul Gems can only trap creatures, not NPCs (note that some creatures, like Dremora, are actually classed as NPCs). Necromancy has researched the rituals necessary to create Black Soul Gems that are capable of trapping the souls of NPCs. The details of those rituals are described on the page describing Black Soul Gems. Once you have a filled Black Soul Gem, it is used exactly like a regular Soul Gem. A Black Soul Gem can hold as much as a Grand Soul Gem (1600), but it is much easier to fill since any humanoid is 1600 units. Azura's Star is essentially the most powerful Soul Gem in the game, and can be obtained by completing Azura's Daedric Quest. Its quality is the same as a Grand Soul Gem; however, it has infinite uses and it is not used up after enchanting or recharging. It cannot be turned into a Black Soul Gem, and thus cannot hold NPC souls. See the page on Azura's Star for more details. These are the only guaranteed locations of empty soul gems. Any others come from random lists. † These soul gems are only accessible during the Vampire Cure quest. Esta página foi modificada pela última vez à(s) 17h06min de 30 de dezembro de 2013.